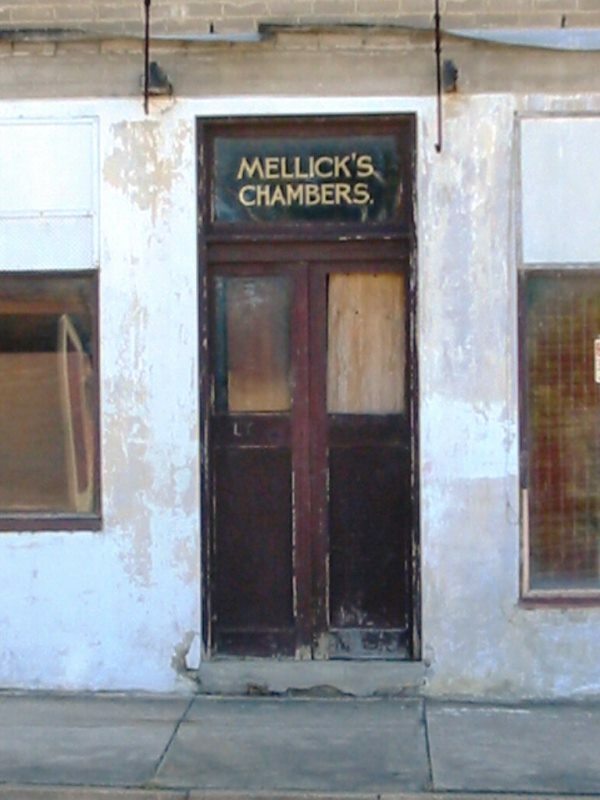 ‘Mellick’s Chambers’ located on the corner of Princes Highway and Wason Street in Milton extended along Wason Street northward from the Highway through to Thomas Street and was generally associated with the life of Cec Mellick a notable Milton businessman who operated shops and a furniture business from the site from 1954 until the 1990’s and had his residence adjoining, called ‘Mellickville’. Its present transformation is the new Chambers Shopping Centre 2013 – 2014, however prior to Cec Mellick earlier buildings on the property had served as the former Milton Council Chambers and also Maddens guest house. It is understood that buildings on the land including the Council Chambers had been erected by a William Wheatley between 1874 and 1877 then on-sold to a Thomas Patterson who served as an alderman on Council during 1895 to 1896. When Thomas Patterson died at Milton on the 1st October 1919, the property which included the Council Chambers was subsequently sold to Herbert James Poole Hall and Esther Hall on the 20th December 1920. At a Council meeting held on the 8th January 1924 it was moved that the lease with Mr Hall for the building at present in use (in Wason Street) be renewed for a term of two years at a rental not exceeding 10/- per week prior to council building a new council chambers. Later the property was purchased by Mary Christina Mellick on 16th March 1945 and the old Council Chambers located to the rear of the property became enclosed by Mellick’s Buildings that included a workshop housing precision woodworking equipment for making furniture.